Michael Joseph McGivney was born in Waterbury, Connecticut on 12th August 1852. His parents were Patrick McGivney and Mary Lynch. Michael’s father hailed from the Drumkilly area of Crosserlough Parish. His mother was from the neighbouring parish of Castlerahan. The couple married in Waterbury on 22nd November 1850. Michael completed his studies at St Mary’s Seminary in Baltimore (Maryland, USA). He was ordained on 22nd December 1877. Fr McGivney’s first appointment was as curate in St Mary’s Church, New Haven (Connecticut). He had a strong desire to develop the religious faith of his congregation, as well to support local families in financial distress. He sought to develop an organisation or society that would help alleviate the hardships of parishioners, take care of the sick and support the families of deceased parishioners. He founded the Knights of Columbus in 1882 and on 7th February of that year the organisation was formally charted by the Connecticut legislature. 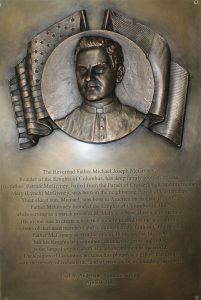 Fr McGivney had envisaged the establishment of a council for the Knights of Columbus in every parish in Connecticut. Today, there are over 15,000 councils across the world, with 1.9 million members promoting the society’s founding principles – charity, unity and fraternity. The organisation’s charitable activities encompass local, national and international projects, including the Special Olympics. On 9th April 2018, Carl A. Anderson, Supreme Knight of the Knights of Columbus, presented a plague to the people of Crosserlough Parish in recognition of Fr Michael J. McGivney. It now takes pride of place on the wall adjacent to the side-chapel in St Mary’s Church, Crosserlough. 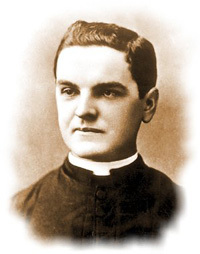 Fr Michael Joseph McGivney passed away on 14th August 1890. He was only 38 years of age. He was given the title ‘Venerable Servant of God’ by Pope Benedict XVI in March 2008 in recognition of his heroic virtue. Venerable Fr Michael Joseph McGivney has now commenced his journey towards Sainthood.